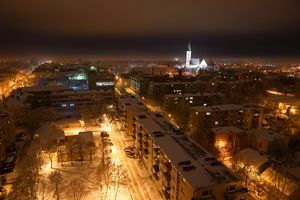 View towards Saints Peter and Paul Cathedral from the Hotel "Šiauliai", at night in winter. Šiauliai is a fourth largest city in Lithuania. Its name derives from the word Saulė, which is a Lithuanian word for Sun. It is named after a Sun Battle that took place nearby. With time the name has changed and had several kinds of spelling. The settlement dates back to Neolithic Era, it became a town in ca XI century, but the official date of foundation is considered to be 1236 when the Sun Battle (Saulės mūšis) took place near the modern location of Šiauliai city. In 1568 Šiauliai was granted Magdeburg rights. Since the end of 16th century became a centre of the region, eventually in 18th century became a well-developed industrial city built in an orderly rectangular grid. In 1795, Lithuania was incorporated into Russia. Šiauliai continue to develop as important industrial, educational and cultural center. During WWI Šiauliai was burned down and totally bombed. Became a Lithuanian city again in 1918, acknowledged to Lithuania by Soviet Russia in 1920. Restored during the interwar years, then bombed again during WWII in 1944 when the Red Army retook it at the war’s end. The city became an important industrial center of the Lithuanian Soviet Socialist Republic and the home for a Soviet Air Force base (10th Fighter Regiment of 7th Mixed Air Division of Baltic Special Military District, and the 18th Military Transport Aviation Division). With Lithuania’s independence in 1991 the Soviet troops had been withdrawn, however the old historical part of the city (with exception of very few buildings and churches) is lost. 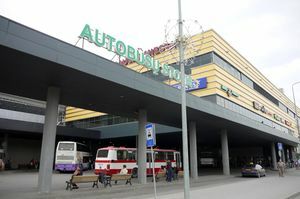 Šiauliai bus station and Saulės Miestas shopping centre. Šiauliai Tourism Information Centre (Šiaulių turizmo informacijos centras), Vilniaus St 213 (Centre), ☎ +370 41 523-110 ([email protected]). M-F 09:00–18:00, lunch break 13:00-14:00. Provides all kinds of information, booking of accommodation and catering. You can get to Šiauliai by train from western or eastern ends of the country as the main railway connects the seaside with the capital, whilst Šiauliai is about at the middle. To get there from elsewhere, including neighbouring Latvia, take a bus. For the trains check the LitRail website, for buses take a look at Bus Tickets (Autobusų bilietai). Šiauliai is not a big city, so you need no more than buses or just your own feet. Buses go all through Šiauliai. There are daily buses that go to places around the city. City buses run from 05:00 to 23:00. You can by tickets in the kiosks or from the driver, one ticket costs ~€0.80. E-ticket system introduced since 2015, the Public Transport E-ticket Card (Viešojo keleivinio transporto e-bilieto kortelė) is available at the bus station office. Only monthly electronic tickets available so far, the regular one-ride paper tickets will be gradually replaced with the all options of electronic tickets in the near future. Timetables are available in Lithuanian for both city buses and microbuses, details on route of every line (list of all stops and detailed schedule) can be seen by clicking on line (bus/microbus) number. You have to know where you have to or want to go first, only then is possible to find out which number you have to take and where to get off. As everywhere in Lithuania, the public transport routes are defined by names of the endpoints, and the path of the route is defined by the set of bus stop names which are linked to the landmarks and street names. Same applies to the suburban bus routes: suburban buses run within the district limits reaching the centres of neighbouring districts and then return back to Šiauliai. For the short trips, for example to the Hill of Crosses, you have to take the suburban bus. Tickets are obtained from the driver, you have to name your destination and number of tickets you want to buy; seat number is not indicated on the ticket, take any if available. As soon as the bus approaches your destination point you are supposed to prepare to get off and to leave the bus immediately. If you keep on sitting till the last second, the new passengers will quickly board the bus making significant inconveniences to you because you'll be an obstacle on their way. It often is more reasonable to reach some destinations (like the centres of neighbouring districts or some places near the main roads) by intercity buses. If the place is by the road between the major settlements where the bus is not scheduled to stop, the driver may agree to drop you off at the desirable spot (usual practice), you simply pay for the ticket up to the closest settlement. Povilas Višinskis square. On a background: cats cautiously crouching on a roof ridge (Vilniaus St 173). 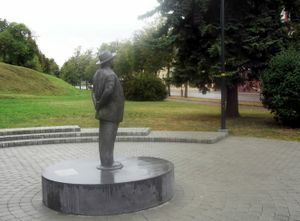 On a foreground left: monument to Povilas Višinskis, a prominent Lithuanian writer and politician. Fountain with sculptural composition "Three Birds" (1981), sculptor Kazys Kasperavičius. Walking around the sculpture, each time you see it from a different angle, plastic lines change creating an impression of movement - birds start to flutter. Restored Chaim Frenkel villa at Vilniaus St 74. Although severely destroyed during the 20th century, the city retained its original urban layout and street network. The new and old buildings of the central part form a unified whole, still calm and cozy as if globalization and urbanization would not have affected its development. Central part with its pedestrian street named after Vilnius, the capital, is pleasant to walk and spend some time without focusing on anything. Cafes, restaurants and clubs are also here. One block north you find Šiauliai Cathedral and City Municipality. Further east you reach an outdoor recreation area by the Lake Talša. One of the most significant buildings that miraculously survived is an Art Nouveau gem, Chaim Frenkel Villa, now a branch of "Aušra Museum", address Vilniaus St. 74 (Eastern end of the street), ☎ +370 41 524-389. Tu-F 10:00-18:00, Sa-Su 11:00-17:00; the Park is open for free M-Su 10:00–22:00. Residence Villa was built in 1908 by the most famous Šiauliai manufacturer Chaim Frenkel, called "the King of Leather" at the time. 1920–1940 the villa operated as a private Jewish gymnasium. 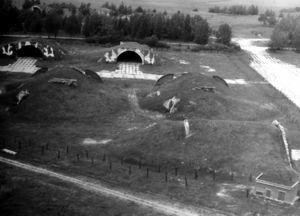 During WWII it was turned into the German war hospital, and after the war into the Soviet war hospital, linked to the Air Force base. Abandoned in 1992, given to "Aušra Museum" in 1994, restoration completed in 2005. Ticket ~€3, guided tour ~€12, audioguided tour in English ~€1.50, photography and shooting for personal event (for one person) ~€6. Next to the Frenkel Villa there was a flourishing leather factory, now abandoned but still in tact, an authentic example of a vintage "brick style" industrial buildings of the end of 19th century. Complete restoration is planned in the near future. Bicycle Museum Vilniaus St 139, ☎ +370 41 524-395. Tu-F 10:00–18:00, Sa 11:00-17:0. Ticket ~€2, guided tour ~€12, audioguided tour in English ~€1.50, photography and shooting for personal event (for one person) ~€6. Radio and Television Museum Vilniaus St 174, ☎ +370 41 524-399. Tu-F 10:00–18:00, Sa 11:00-17:0. Ticket ~€2, guided tour ~€12, audioguided tour in English ~€1.5, photography and shooting for personal event (for one person) ~€6. Chocolate Museum (Šokolado muziejus), Tilžės St 133 (Centre), ☎ +370 41 523-212, mobile +370 610 41050 ([email protected]). M-F 10:00-19:00, Sa 10:00-17:00. Exposition topics: Chocolate History, "Its Majesty" Chocolate, Chocolate in "Rūta". Museum occupies premises of chocolate factory "Rūta", built in 1929. Company "Rūta" was established in 1913 as a candy workshop, the name (Lithuanian for Rue) aimed to highlight its national character. In 1993, ownership of the "Rūta" was returned to the actual owners, it once again became a factory producing unique and original confectionery in Lithuania. Museum also offers two educational programs: one for adults, another for children. Ticket ~€3. National Dolls Museum Vilniaus St 213, ☎ Mobile +370 683 55723 ([email protected]). T-F 10:00-18:00, Sa 10:00-16:00. More than 900 dolls from 101 country. Adult ~€2.50, family ticket ~€3.50. Sculptures. You can find small sculptures and fountains all over the city: semi-abstract sculptural composition "Three Birds", fountain "Rūdė" (named after the rivulet that once flowed there), sculptural composition "Pelicans", sculpture "Motherhood", sculptural composition "Three Dwarfs", sculpture "Dawn", sculpture "A Grandfather With His Grandchildren", sculpture "A Reading Man". 1 — Sundial Square (Saulės laikrodžio aikštė) - a monumental sundial on a halfway from Cathedral to the recreation area of citizens by Talša lake, address: Aušros Path from Cathedral and Meškeriotojų Street from the lake; coordinates 55°55'50.64"N, 23°19'30.61"E . The square is designed as a reminiscent of ancient Greek amphitheater, with a 18m height column in the centre, topped with 4m tall statue of "Archer" ("Šaulys") made of gilded bronze. The Archer, often called "Golden Boy" ("Auksinis berniukas"), is probably the most prominent symbol of Šiauliai. The square was completed in 1981, authors: architects Algimantas Černiauskas, Remigijus Jurėla, Algis Vyšniūnas; sculptor Stanislovas Kuzma. 2 — Dawn (Aušra) - sculpture, address: intersection of Aušros Alley and Kaštonų Alley; coordinates 55°56'9.75"N, 23°18'45.93"E . Four metres in height, the monument depicts Lithuanian Dawn Goddess, but also has other symbolic meanings that are easily deciphered by Lithuanians. Erected in 2003. Author: sculptor Dalia Matulaitė. 3 — Cathedral of the Apostles Saint Peter and Saint Paul - a sundial on the wall of Cathedral, address Aušros Takas (Dawn Path) 3; coordinates 55°55'57.21"N, 23°19'12.14"E . One of the oldest sundials in the country. 4 — Solar Disks (Saulės diskai) - fountain with abstract sculptural composition, address: Prisikėlimo Aikštė (Resurrection Square in front of municipality building at Vasario 16-osios St 62); coordinates 55°55'56.04"N, 23°19'4.19"E . Constructed in 2006 to commemorate 770th anniversary of the Sun Battle; the name for the composition was chosen by Šiauliai citizens in a poll. Author: sculptor Gintautas Lukošaitis. 5 — Cockerel Clock Square (Gaidžio laikrodžio aikštė) - small square in the beginning of central pedestrian street, features a composition with clock and crowing rooster, address: intersection of Vilniaus and Tilžės streets; coordinates 55°55'52.19"N, 23°18'54.32"E . In 1976 Šiauliai celebrated 740th birthday, it was commemorated by erecting the city clock with "Crowing Rooster". Rooster was singing a funny Lithuanian pop song "Come To Rendezvous" ("Tu ateik į pasimatymą"), soon it became a popular spot for the rendezvous. Authors: sculptors Vilius Puronas and Stanislovas Kuzma. 6 — Stained glass window Sun Battle (Vitražas "Saulės mūšis") - composition created from pieces of colored glass, connected by metal and concrete frames, depicts the famous battle. Address Tilžės St 140 (within Concert Hall "Saulė", city centre); coordinates 55°55'46.91"N, 23°18'47.63"E . Constructed in 1986 to commemorate 750th anniversary of the Sun Battle. The whole composition is 52m in length, the total square is 200m². Author: stained glass artist Kazys Morkūnas. 7 — Monument to the Sun Battle - a wooden folk-style composition commemorating the Sun Battle in Salduvė Park (near Salduvė Hill Fort in Lepšiai district); coordinates 55°55'46.93"N, 23°21'35.66"E .
Churches, Siauliai has 4 churches. Cathedral of the Apostles St. Peter and St. Paul. Saints Peter and Paul's Church of the Othodox parish. The Talša Eco-educational Path (Talšos ekologinis takas) - starts in the recreation area at SW corner of Talša lake (coordinates 55°55'46.5"N, 23°19'37.65"E) and leads along the southern and all eastern lake shore, turns CW on a hill with panoramic views, and proceeds on to the south up to Aleksandrijos street; from there it leads along this street SE up to Salduvė Hill Fort. The path has 19 stations with info stands, the total length is about 5km. Path is suitable to visit in any season of the year. Created in 2003, features vestigial untouched nature of the eastern shore, the panoramic landscape of the lake and its surroundings, fragments of habitations of European importance: natural eutrophic lakes with communities of pondweeds, eutrophic higher herbage, hay-fields of mezophyte, mediate swamps and marshes, non-calcareous springs and springy swamps, broad-leaved and mixed forests. The Hill of Crosses (Kryžių Kalnas), north of Šiauliai is a national centre of pilgrimage in Lithuania. Standing upon a small hill, a former hill-fort, are many hundreds of thousands of crosses that represent Christian devotion and a memorial to Lithuanian national identity. Over the centuries, the Hill has come to signify the peaceful endurance of Lithuanian Catholicism. After the 3rd partition of the Polish–Lithuanian Commonwealth in 1795, Lithuania became part of the Russian Empire. Poles and Lithuanians unsuccessfully rebelled against Russian authorities in 1831 and 1863. The two uprisings are thought to be connected with the contemporary use of the hill as a religious site. When families could not locate bodies of perished rebels during the uprisingslink title, they started putting up symbolic crosses in the location of a former hill fort. After WWI, in 1918 Lithuania regained independence. In 1922 there were 50 crosses, the number before the WWII reached over 400. 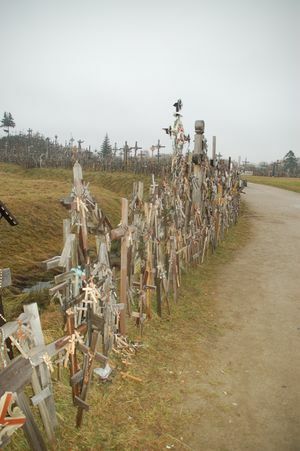 During that period the Hill of Crosses was a place for Masses and devotions. After WWII Šiauliai region became a part of the Lithuanian Soviet Socialist Republic. 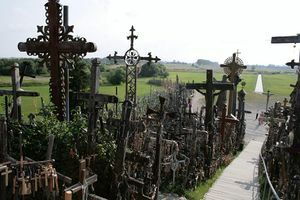 During the Soviet era, the pilgrimage to the Hill of Crosses became an expression of Lithuanian nationalism. The Soviets repeatedly removed the crosses placed on the hill by many nationalistic and Christian Lithuanians. In 1961, 1973 and 1975 the Hill was cleared and the crosses were burned or turned into scrap metal with the area being covered with waste to discourage further similar activities at the site. 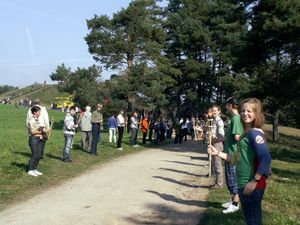 On each occasion the local inhabitants and pilgrims from all over Lithuania replaced the crosses on the hill. The hill is currently visited by many thousands of visitors and pilgrims from all over the world. The current number of crosses is unknown. Estimates put it at about 55,000 in 1990 and by 2006 the number had grown to an estimated 100,000. Diverse styles, designs and sizes are represented amongst the crosses. Some are carved out of wood, others sculpted from metal. The crosses range from 3m tall to countless tiny examples hanging upon and about the larger crosses. On 7 September, 1993, Pope John Paul II visited the Hill of Crosses, declaring it a place for hope, peace, love and sacrifice. In 2000 a Franciscan hermitage was opened nearby. The interior decoration of this monastery draws upon La Verna, the mountain where St. Francis received his stigmata. By car, take the A12 road, toward Joniškis; Ryga. After the roadsign "KRYŽIŲ KALNAS - 2km", turn right. By bus: From Šiauliai bus station, Joniškis direction. Leave the bus at the DOMANTAI stop, walk about 2km. To get back to Šiauliai walk back to the Domantai stop and wait for a bus. It is important that only suburban buses stop there, all intercity buses will pass you by. By taxi: From Šiauliai centre take a taxi, when at the spot tell the driver to wait (taxis usually wait up to 30 minutes), make sure you understood each other. Drivers may not speak English, but everybody understand and expect that you will be going to the Hill of Crosses. There also is a taxi service Šiauliai-Riga, expenses shared between passengers are worthwhile. 300 m away from the Hill is a Christian monastery. It has sixteen cells. This monastery serves as a novitiate of the Lithuanian Franciscan province of St. Casimir but is also open to the pilgrims who may look to it for silence and peace. This hermit of the Franciscan Brothers was consecrated on 7 July, 2000. If weather is good rent a bicycle and explore the city. Trip to the Hill of Crosses by bicycle also is feasible. 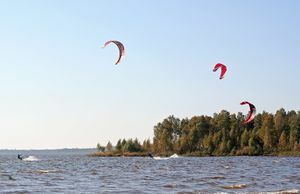 Water sports in Rėkyva Lake south of city, access from its SE shore. Directions: from the city you have to get to suburban village Rėkyva, public transport from the centre or the bus station area is a city bus #4 and #4A. The bus runs away from the bus station area, crosses the railway, runs across the industrial districts and then turns toward outskirts. You have to get off at "Poilsio" stop and walk down the Poilsio Street up to the beach; the bus proceeds to run further on for several stops, then returns back. The yacht club, cafe and hotel (Poilsio St 8) that occupied the buildings of Rėkyva manor estate, currently are closed as all manor complex is undergoing a complete restoration (as of beginning of 2015). One of the country's red-letter days, Balts Unity Day, is directly associated with Šiauliai: 22 Sep 1236 is a day when the Sun Battle took place in vicinity, Samogitians and Semigallians defeated the Knights Of Sword. In 2000 parliaments of Lithuania and Latvia declared September 22 a Balts Unity Day. Symbolically, the sun reaches the autumnal equinox point on this day. This day also is a part of Latvia-Lithuania Cross-Border Cooperation Programme, which aims to develop border regions of Latvia and Lithuania. Annual celebration takes place in surroundings of Žuvininkai Hill-fort, also known as Salduvė Hill, located in the eastern part of the city municipality, between Lake Talša and Ginkūnai Reservoir, Lepšiai district. Gama Galant Draugystės Ave 8C (north of railway station, slightly away from the street eastward), ☎ +370 698 82882 ([email protected]). M-F 10:00-20:00, Sa 10:00-14:00. Also available on social website. Apart the hairdresser services (manicure, pedicure, eyebrow correction) offer massages and mini SPA treatments. Asking price, depends on procedures. Šiauliai city is a centre of district municipality. Most of the district lies in Samogitia region, whilst only its eastern corner belong to Aukštaitija. Šiauliai itself always was at the periphery of both regions, although belongs to both, too. Lithuanian ethnographic regions are not associated with administrative division. If interested, distinctions of two regions can be acquainted by exploring Šiauliai district and its close vicinity. Šiauliai District Tourism and Business Information Centre (Šiaulių rajono turizmo ir verslo informacijos centras) is located not far from the Hill of Crosses in Jurgaičiai village, Meškuičiai elderate (Near the A12 highway), ☎ +370 41 370-860 ([email protected]). 09:00-17:00. Provides free information about places of Šiauliai District, accommodation, catering services, events in Šiauliai region, sells souvenirs, maps. While the best known site near Šiauliai, the Hill of Crosses, is situated north of the city, the most attractive recreation area lies some 20km south-west from Šiauliai centre. The area is commonly known as Kurtuvėnai Forest, which is a part of Kurtuvėnai Regional Park with the centre in Kurtuvėnai village. The management of Regional Park with the guest house is settled there. Horse riding centre locates in the stables of Kurtuvėnai Manor and operates since 1995. The three-star camping site "Kurtuvėnai" was established in the garden of the manor in 2008. The tavern "Kryžkelė" (“Crossroad”) was opened in the renewed peon's house. The building was built for the czarist army's warehouses when they dig Venta-Dubysa channel in the 19th century. Here you can try, of course, genuine Lithuanian beer, as well as some culinary heritage dishes which are made using old traditions. 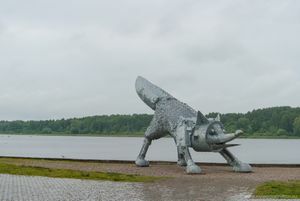 The Regional Park has numerous places, related to Lithuanian national movement of the junction of the 19th-20th centuries and to the events of both world wars. Kurtuvėnai has a rich, nice and diverse environment. Park area covers 17,252ha, including 12,130ha of the forests. Whole park’s territory is divided to several zones: conservation (nature reserves), ecological priority (preservation), recreation, economic (forestry, agriculture) and living zones. Sparsely populated, park territory has about 1,200 local dwellers. 30 small lakelets are swashing and 20 forest rivulets are running in the shelter of forests. Kurtuvėnai settlement is surrounded by nearly 100 fishery reservoirs. In the western part of the park there spurt well-known multiple springs of Svilė, which are considered to be the biggest in Lithuania. Predominant forests are coniferous. The landscape is characterized with high biodiversity of vegetation, some 981 plant species have been found there. There can be found many common species of birds and animals, even wolves are among them here, they permanently live in the western part of the forest. Some of the habitats are of European importance (Natura 2000). There are 2 cognitive paths (about 4.5km each one) and 2 bicycle trails, 6 defensive hill forts, 8 interesting landscape objects, 15 alone standing trees, each of which is a separate object of interest, related to one or other historical event or is just an expressive example of nature. The Shrovetide Feastival of Kurtuvenai is acknowledged as a one of the most viable traditional festivals all over Lithuania. Also, other feasts take place there, such as the Festival of barn-theaters, Fire-linkup on the Girnikai hill fort, Midsummer Feast, and various events of the Christmas time. One of the best known attractions here is Kurtuvėnai Horse Riding Centre Parko street 2, Kurtuvėnai, LT-80223 Šiauliai district (From Šiauliai centre drive South-West down the A12 highway (Kelmė direction) about 15km, then turn right after Bubiai village (road No 215) and drive about 5km, then turn left to Kurtuvėnai), ☎ For reservation +370 41 370-333, Mobile +370 618 29964 ([email protected]). "Open. Price for 2 persons ~€80, including two nights accommodation in ***camping. Two cognitive tours to Gruzdžiai elderate, organized by Šiauliai District Tourism Information Centre. Gruzdžiai is a village lost in time and space, located about 25km north of Šiauliai, accessible by the road No 154. First tour is visiting a Black Ceramics Workshop of local artists. 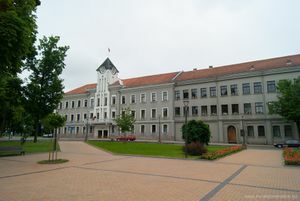 Workshop is located in the old dairy building of Gruzdžiai Manor (address Jaunimo St 17, Gruzdžiai). Visitors are introduced to the process of kneading of clay, throwing pottery, claywork; groups up to 50 people. Also, visitors themselves may be allowed to perform the whole process to combustion; groups up to 20 people. 5 — 10kg ham baked in a rustic oven and served with sauerkraut and potatoes. Shall be ordered with/without options 3 & 4 no later than 7 days in advance. Confectionery, including products of Lithuanian gastronomy heritage, at "Rūta" shop Tilžės St 133 (Centre), ☎ +370 41 523-328. M-F 08:00-19:30, Sa 08:00-17:00. Has branches in "Tilžė" shopping centre, address Tilžės St 225, working hours M-Sa 10:00-20:00, Su 10:00-19:00; and within "Maxima" grocery store, address Vilniaus St 200, working hours M-F 09:00-19:00, Sa 09:00-16:00. Chaim Frenkel Villa restaurant Vilniaus St 74, ☎ +370 614 80886 ([email protected]). Tu-Sa 12:00-22:00. Modern European Restaurant. Senasis sodžius (The Old Grange), Stoties St 3 (near Bus Station - across the main street, in front of the eatery “Dubysa”), ([email protected], fax: +370 41 431-867). M-Th 11:00-18:00, F 11:00-18:00, Sa 10:00-16:00. This is a good place in Šiauliai to try traditional Lithuanian food. Service is nice and fast. Prices are quite low and food quality is great. It is not a big place, but it is very popular, so better avoid coming in lunch hours if you have no time to wait. Lunch ~€4. Havana Rūdės St 27D, (Near central Maxima supermarket), ([email protected]). Within boiler room of a former “Venta” factory, authentic industrial interior. Bar-cafe “Katilinė” (“Boiler Room”) in the basement, 50 seats. Banquet hall (40 seats) and conference hall (80 seats) on the 2nd floor. Juonė pastuogė (Music club-tavern Jwahn's Shialter), Aušros Al 31a (Slightly NW of the centre), ☎ +370 41 524926 ([email protected]). Lithuanian country music club, the name is spelt in Samogitian dialect. Live folkish, american-like country, sometimes Lithuanian pop music. Genuine Lithuanian tavern atmosphere. €7.5-13. Café "Rūta" Tilžės St 133 (Centre), ☎ Reservation +370 611 10766, +370 616 00191 ([email protected]). M-Sa 10:00-22:00, Su 10:00-20:00. Accepts advance orders for confectionery products. Day lunch M-F ~€3. Kavinė "Mažylė" (“Tiny Tot” Cafe), Pramonės St 15, (Industrial district), ☎ +370 41 540-551 ([email protected]). Workdays 08:30-19:00. Has 2 halls, 40 seats each. Organize banquets, parties, birthdays, weddings, hen/bachelor parties, funeral dinners, anniversaries. Cards accepted. Saulininkas (Sun Master), Lukauskio St 5 (Centre), ☎ Mobile +370 686 81187 ([email protected], fax: +370 41 421-848). Three star Hotel and a Guest House next to each other. Hotel €45-90 (breakfast included). Šiauliai Draugystė Ave 25 (Centre, walk at a right angle away from the railway station up to the T-junction, turn left. From bus station walk NE up to the main pedestrian street Vilniaus, turn to the right and walk for several minutes up to the tall (14 floor) building by the left hand side), ☎ Info +370 41 437-333 ([email protected], fax: +370 41 438-339). Three star Hotel, 118 rooms, conference hall (80 seats), restaurant, bar "Martini Club", gym, billiard. €28-60, lux ~€90. The Šiauliai (both town and the district) phone code is 41 and the 6 digit local subscriber number. Šiauliai Central Post Office (Centrinis Šiaulių paštas), Aušros al. 42 (Centre), ☎ +370 41 523-727 ([email protected]). M-F 07:30-19:00, Sa 08:00-15:00. Kaunas, Lithuania's second city is to the south east. Plungė, Samogitian town on the way to the coast. 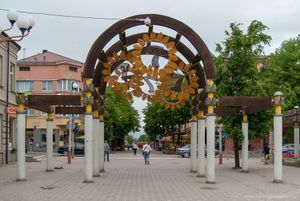 Telšiai, the unofficial capital city of Samogitia region. This page was last edited on 1 August 2017, at 15:34.